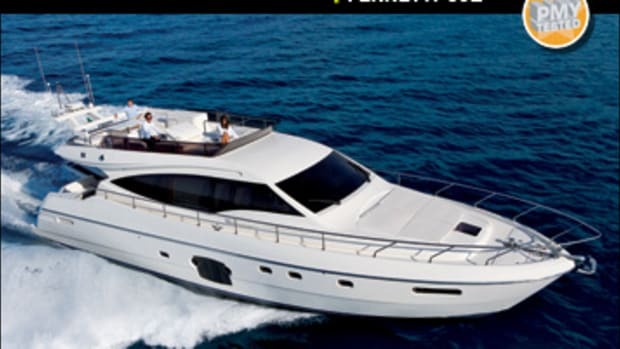 Elegant, spacious, and Speedy, the Ferretti 800 opens up a world of at-sea possibilties. When the going gets tough, the secret of success is much the same as it is when the living is easy: keep moving. You can be certain that’s what your competitors will do, and if you don’t, you won’t be competitors for very long. In the boat business, keeping moving means producing attractive and innovative new designs, each one of which represents a huge investment in time, talent, and resources over months, or even years. The Ferretti Group has found the market as difficult as every other boatbuilder over the last couple of years, but one look at the latest motoryacht launched by its flagship brand should dispel any doubts about this shipyard’s confidence in the future. 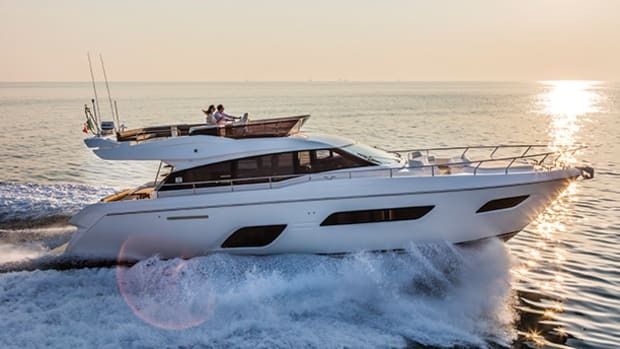 The Ferretti 800 made her public debut in the spring at the lively little seaside town of Cattolica, on Italy’s Adriatic coast. 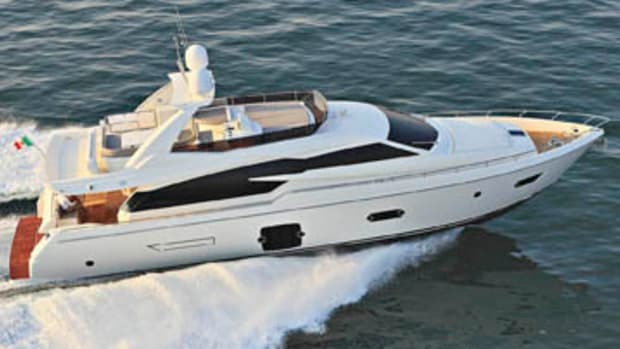 The group has taken to adopting the port during April for owner and VIP guest events, and in a sort of mini boat show, takes over most of the outer harbor with a gleaming row of expensive motoryachts from across the product range. Pershings and Rivas vie for attention with yachts from Mochi, Itama, and Custom Line, while fishing boats chug in past the breakwater and curious passers-by stop and stare. 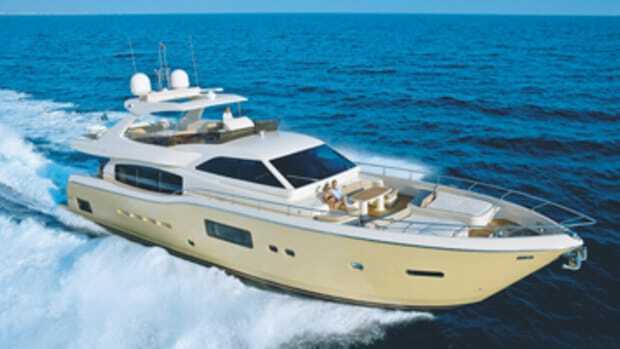 Even among this illustrious company, the latest offering from Ferretti Yachts had no difficulty standing out. 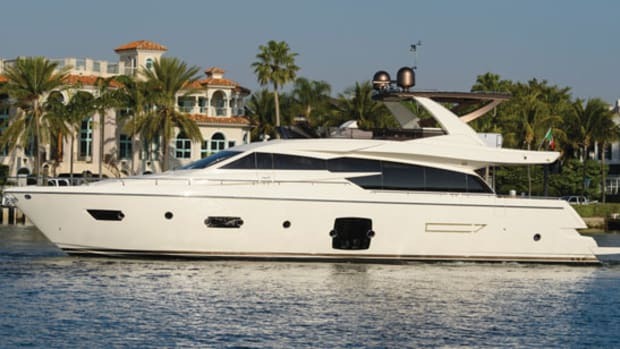 The dark bronze on her flying bridge is a radical departure from Ferretti’s traditionally conservative cream coloring, and the diagonal window slits in the superstructure, which the designers liken to the gills of a shark, are just as unusual. The real innovations, however, are to be found inside, and there are plenty of them. Perhaps the most significant is the main-deck layout. In a feature reminiscent of the Riva 92 Duchessa, the helm station is to port on its own raised deck, with a passageway down the starboard side. This leads, via a low-level lobby area complete with secluded breakfast bar and dinette, to the well-equipped, Ernestomeda-designed galley, which not only has its own sliding door but can also be completely hidden behind an electrically operated screen. The two twin-berth en suite crew cabins are in the bow, reached via a short forward companionway. There is another sliding door in the wheelhouse bulkhead, and this combination of doors and screens provides plenty of permutations of privacy. In a formal situation, the entire forward half of the yacht can be given over to the crew, with helmsman and chef able to work undisturbed, and doors on both sides for access to the deck—and, therefore, to the rest of the yacht. For less formal occasions the galley and crew accommodation can still be secreted, allowing guests access to the wheelhouse, breakfast bar, and forward dinette—with the galley screen always available should they need to order a cappuccino. It is a remarkably flexible layout, one that is designed to suit owners of nearly any persuasion. One drawback, however, is that it places the galley well forward, some distance from the beautiful Bonaldo dining table, and even further from the cockpit and the flying-bridge steps. On the other hand, the bulkhead behind the helm seat is glass, so even with the door shut, there is still visibility aft for the helmsman, as well as plenty of light transmitted through the windscreen into the saloon. The lower deck is equally novel, with its three double cabins—it’s probably unique in this size of yacht. Both master and VIP suites span the entire beam of the hull, and all cabins have large hull side windows with opening portholes. 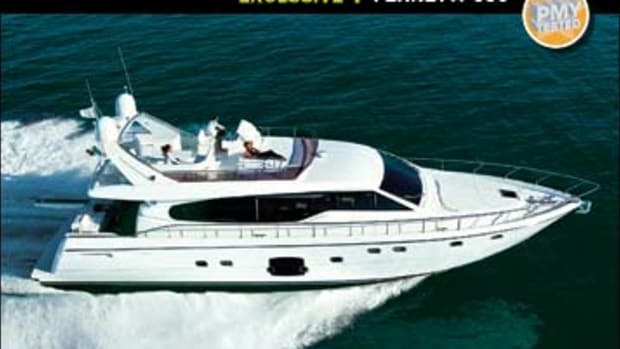 Ferretti owners’ suites have been hard to beat in recent years, and the 800’s is no exception. Keeping to its tried-and-tested layout, the shower, basin, and MSD are on the starboard side behind a big translucent screen door, enjoying the full benefit of the enormous hull window. The mirror over the basin can even slide away, should you prefer the view of the sea, rather than yourself, first thing in the morning. I think I know what I would do. The master suite also has an enormous corner wardrobe and a full-length sofa along the port side. Although the VIP doesn’t enjoy quite as much floor area as the master it is still a remarkably spacious suite, with a big shower/MSD—with its own sliding mirror—and plenty of stowage space. The 800’s third double cabin hides a secret. Not only does it also have ample stowage and a head compartment to rival—in floor area, if not in outlook—those of both of the two larger suites, it also boasts a double berth that can split in half and slide apart, to make a pair of full-size twin berths. 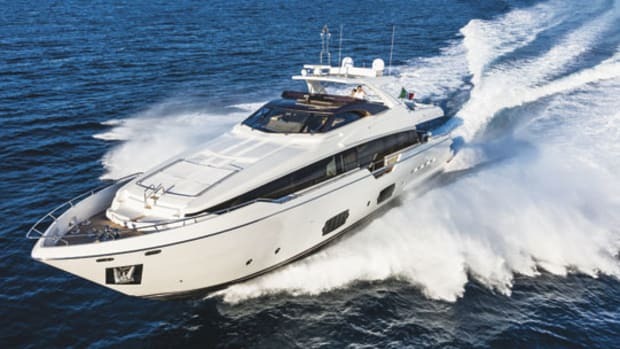 If one memorable feature of the Ferretti 800’s lower deck is the generous hull volume allotted to the three double cabins, it is in the fourth cabin that you can see how this trick has been achieved. It is not especially small—the lower of the two right-angled bunk berths is a good 3&apos;3" wide, and headroom in this part of the hull is a comfortable 6&apos;8", compared with 6&apos;6" in the master and VIP—but floor area and stowage are limited. The head compartment, on the other hand, although the smallest of the four, is still roomy and comfortable. The 800’s interior is finished to Ferretti’s usual impeccable standards, with a relaxed color scheme of satin-varnished elm, off-white fabrics and headlinings, and leather detailing, with dark, reflective areas of teak, maple, and walnut flooring to provide tonal contrast. Out on deck, the forward seating area offers a comfortable U-shape sofa and table, with an enormous upholstered area behind for sunbathing. In the cockpit, the sofa back slides forward cleverly for added comfort while eating at the table. The transom platform looks rather small at first, until the stern garage opens and folds down to provide a large decked area for swimmers. Up on the flying bridge there is room for everyone aboard to sit and relax, with the huge hardtop providing plenty of shade. Her flying bridge also extends well aft to protect the cockpit and provide stowage space for the tender. The engine room can be accessed either through the cockpit hatch or via the companionway in the port quarter. Just one machinery package is offered: a pair of MAN’s brand-new 1,800-hp V12s, which recline in some luxury in a well-engineered and spacious compartment, mounted horizontally and driving aft through V-drive gearboxes with a ten-degree down-angle. With such a wealth of power, a top speed during our trial of 31.4 knots (36.1 mph)—impressive for a 70-ton yacht—was only to be expected. What was surprising, however, was the way the 800 behaved on the water. Acceleration was remarkably brisk—from rest to 25 knots (28.8 mph) in less than 25 seconds—but more important the vessel’s handling was precise and nimble, and a genuine pleasure for the driver. 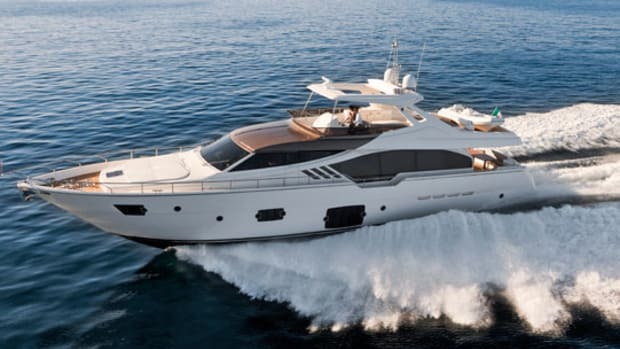 Ferretti’s engineers have assured me on numerous occasions that they regard sportboat-style handling as inappropriate for a big motoryacht—but now they have built one that handles as well as any of its more sporty rivals. I’m sure it wasn’t an accident. 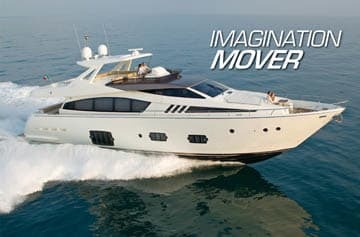 If the secret of success is to keep moving, then Ferretti has shown how it should be done with its new 800. This highly accomplished motoryacht offers genuine innovations and improvements, at every level—and out on the water too, where keeping moving is exactly what you’ll want to do. 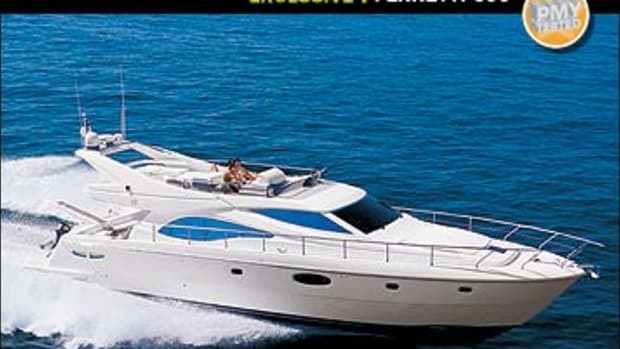 Allied Marine (954) 462-5527. www.powerandmotoryacht.com/ferretti.